18 MMS October 2017 mmsonline.com THE Z AXIS Commentary When I shared a video involving machining business owner Regina Mitchell on social media, I thought what she had to say might lead to a conversation involving other shop owners. Ms. Mitchell, president of Warren Fabricating and Machining in Ohio, was interviewed on CNN about the problem she sees and the challenge her busi- ness faces regarding the number of prospective employees now failing the company's screening for drug use. I already knew other shop owners were seeing and facing this same problem; they've told me as much. But I was naïve to expect they would engage on the issue within a social media discussion. This is an issue that leaves manufac- turing employers perplexedly confronting a poten- tially troubling social trend, coupled with public attitudes that pull in contradictory directions. The reaction I did get gave me a hint of this. To be sure, the commenters were few—not enough to offer a representative sample of anything. 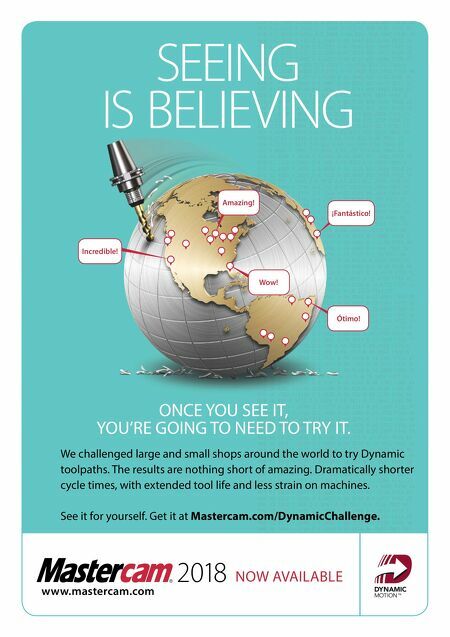 (An update: I later posted the video in our "Top Shops" LinkedIn group and got a higher level of response there—see bit.ly/mmstopshops .) Yet various commenters responding to Ms. Mitchell's asser- tions were challenging toward her or critical. She was met as though the stance she was advancing was dubious, as though it sprang from her being somehow reactionary or judgmental. To the contrary, there was nothing judgmental in her point. I don't know her political opinions; she or any business owner might in fact believe drug laws are too strict. Yet that would not change the fact that our system—not to mention the business owner's conscience—will hold the business account- able for the safety of employees. A coffee shop or an accounting firm might be able to risk being oblivious to the habits of employees, but the work of a machine shop obviously involves using machin- ery powerful enough to rapidly cut metal. Given that an impaired person is prohibited from driving a car, should an employer not provide safeguards against an impaired person running a VTL? There is more. Machining is a business based on consistency and precision. If a person's habits involve making compromises where the law is concerned, is it not reasonable to fear the same person will make compromises where work pro- cesses and quality are concerned? With that last question, maybe I am being judgmental. Maybe it would be unfair or prejudiced for a shop owner to make the leap I have just made. But here is the thing: Libertarian permissiveness cuts both ways. If I am to be open toward one's personal choice of recreation, I ought to be equally open toward a private business owner's personal choice of hiring and employment standards. Skilled manufacturing work is a wonder ful opportunity for people able to thrive within the concrete realm of physics and machinery over the more fluid realm of people and their shifting priorities. Yet it is that very concreteness that here leaves a darkness or a complexity of our current age revealed. Manufacturing involves performing repeatably within the real, physical world. With its tiny margins for error, the work offers little room for rationalization. 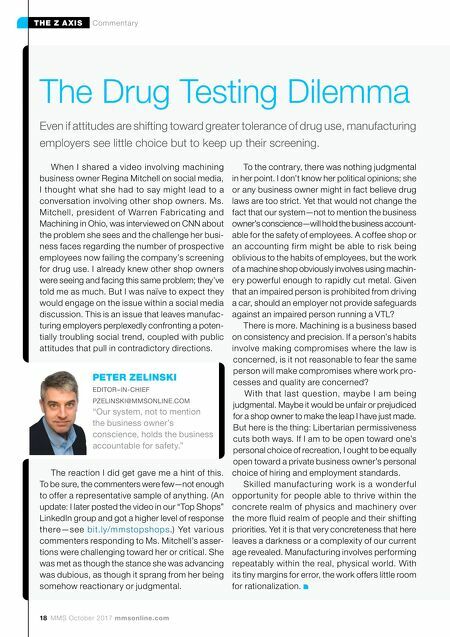 The Drug Testing Dilemma Even if attitudes are shifting toward greater tolerance of drug use, manufacturing employers see little choice but to keep up their screening. PETER ZELINSKI EDITOR–IN-CHIEF PZELINSKI@MMSONLINE.COM "Our system, not to mention the business owner's conscience, holds the business accountable for safety."